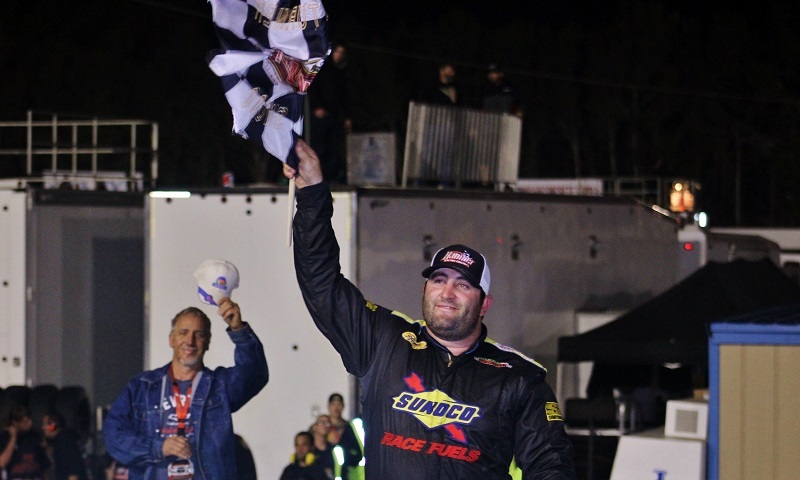 PENSACOLA, Fla. — Bubba Pollard may not run on pavement — or in a Pro Late Model, for that matter — very much anymore, but he proved Saturday night that he can still run with the best when he does. Pollard controlled the Allen Turner Snowflake 100 and led a race-high 81 laps en route to his second-career victory in the Pro Late Model classic at Five Flags Speedway, weathering a torrid first-half battle with Jeff Choquette and pulling away down the stretch to capture the checkered flag. After starting on the pole, Pollard paced the field early on and only relinquished the top spot twice, after electing the outside lane for a restart on lap 15 and again when Choquette surged around him on lap 28. 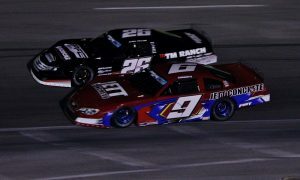 But Pollard took the lead for good on lap 45 and ran out to a commanding 1.656 second victory down the stretch, as he seeks to become the first driver in history to win both the Snowflake 100 and the Snowball Derby in the same year. Restarts were a point of contention all night, as they were largely the key to Pollard and Choquette’s deft exchanges of the lead. Pollard came into Saturday’s Snowflake 100 with one goal in mind: stop the roll of Casey Roderick, who dominated the Pro Late Model scene all year long with 18 victories. The most notable incident during the race came on a restart with 21 laps complete, when Pollard waited until the end of the restart box to fire and the field stacked up behind him, causing a multi-car melee in turn four that saw the No. 04 of Corey Roper ramp up and over the front end of Perry Patino’s No. 51. In total, nine cars were eliminated, including Cole Anderson, Bobby Knox Jr., Ryan Worsham and Joe Graf Jr.
Spencer Davis surged from 16th to come home second behind Pollard, lamenting what might have been after having one of the fastest cars all weekend long. Anthony Cataldi charged from 28th all the way up to complete the podium in third, while Choquette faded to fourth and three-time Snowflake 100 winner Augie Grill rallied from numerous issues to round out the top five.